Well Lalchitri how did your frog spawn do? Hardly space to swim I should imagine if all the spawn developed! I would guess they were this years Will, but only from the fact that I saw none at all when torching earlier in the year. 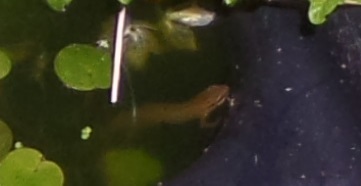 It is a real mystery as I have seen smooth newt larvae very often and nothing even approaching the size of these. Some have lost their gills and are swimming about with the adults. There are no normal sized ones I've seen either! It will be interesting to track their progress - maybe they'll keep growing and become neotenous! Went out this morning as the sun started to shine on various refugia. The slow worms only needed fifteen minutes warm up and then they were off. I even spotted a large slow worm just about to go under one of the Coroline covers as the sun started to hit it (nothing underneath at the time). Temperature up to 29 deg here today. This evening I saw about a dozen palmates but discovered wearing a head torch and working a camera is tricky as I created shadows and wasn't sure if to use the flash or not. Last year was a disaster for me. Probably the most spawn I’ve ever had (roughly 100 clumps) yet not a single tadpole survived as the pond lining split and the pond leaked. Oh no what a sad ending! Have you laid a new liner? Couple of frogs swirled off in my largest pond this morning. Temps are up...10degC today. Will have a look tonight and see what's about. A second warm, damp night here. The scene looks like it's starting to get set so i checked the ponds earlier and there were around 10 scattered males resting quietly, plus a 'gay' couple. However, it's normal to find low numbers of frogs throughout the year on all but the coldest days/nights. My partner claims to have heard calling today, but in this sector at the mo, it seems all quiet on the south-western front. I see frog spawn was photographed in Truro on 4th Feb though. No Ben..temps fell a bit this evening and all I saw was one palmate. Mmm now I'm not sure they were frogs the other day. 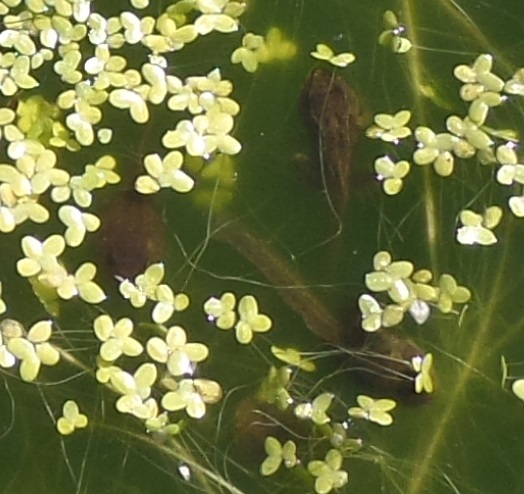 Today I went out and there was much disturbance on the surface in the pondweed and I thought a frog, BUT it was one, or maybe two, palmate thrashing about. Having said that there was one trail of bubbles going off underwater the other day, like you get from a frog but not a newt! I will just have to have a proper sighting before I get over excited about frogs again! I did watch several times today as it was sunny and 10 degC (after zero this morning) but nothing moving except the newt/s.